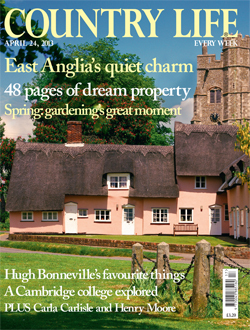 This week’s magazine is a packed issue with 48 pages of dream property in our East Anglia special number which features Mary Miers on the artists inspired by this part of the world. We also ask Hugh Bonneville about his favourite things, and celebrate the joys of spring in the garden. You can also rate and review the app on the app store, wherever you are in the world. All this on Ipad, (with a week’s free trial – click on the cover below), plus online at Zinio and find us in the Kindle magazine shop.